Allen Iverson almost had the perfect season. He played an amazing year, won the MVP title, lead the 76ers to the playoffs as the no. 1 seed and all the way to the NBA Finals. The only thing needed to cap off his grand season was a NBA Title and Finals MVP award. 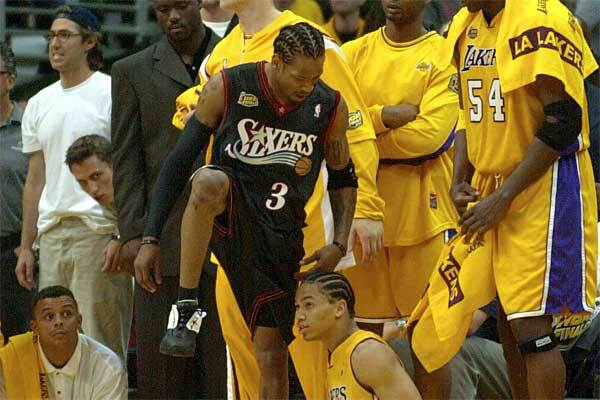 This had to be Iverson's year. He carried the 76ers on his back, got them where they needed to be, and they were facing the defending champions, The Los Angeles Lakers. The Lakers were on a 11-0 run in the playoffs so far, breezing through the Western Conference with ease. As the first game approached, Kobe and Shaq seemed to not be troubled by the minor issues that began during the regular season between the two. This was the chance at creating a legacy and winning another championship. 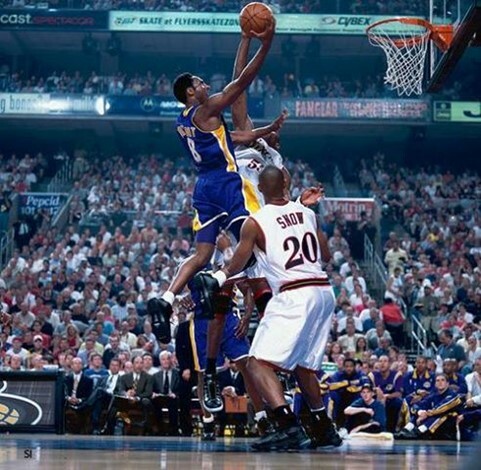 The Lakers starting lineup consisted of Derek Fisher, Kobe, Rick Fox, Horace Grant and of course Shaq. The 76ers would of course have Eric Snow, Iverson, George Lynch, Tyrone Hill and Mutumbo. -June 6th, 2001. The 76ers defeated the Bucks in the Eastern Conference finals to earn their spot here, and they would manage to walk away with game 1, putting a stop to the Lakers' undefeated playoff run that year. The game went into overtime and Iverson hit a jumper over Tyronn Lue, which has become an iconic moment in Iverson's legacy and NBA Finals legacy. 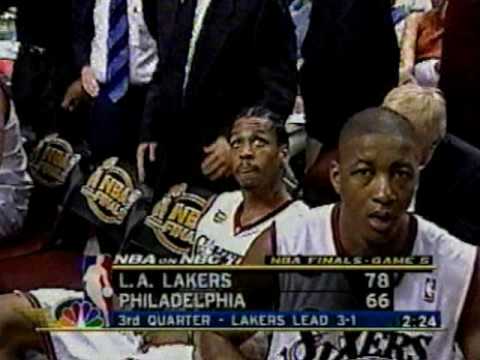 Shaq would finish with an amazing 44 points and 20 rebounds, while Iverson would walk away with the first(and only) NBA Finals victory after scoring 48 points in the game. The Lakers gave up game 1 at home in the Staples Center, but they would fire back mightily in game 2 and the rest of the series despite this 107-101 OT loss. 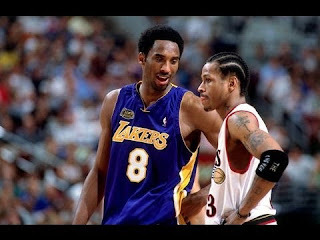 -After allowing Iverson to score 48 points in their game 1 loss, the Lakers managed to hold A.I. to 23 points, while Kobe was the highest scorer in the game with 31 points. Shaq's performance however was amazing, racking up 28 points, 20 rebounds, 9 assists, and 8 blocks, almost walking with a quadruple-double. 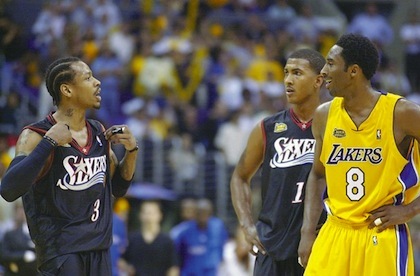 The Lakers would edge the 76ers, who attempted to make a fourth quarter comeback, 98-89 to even the series at 1-1. -This was a very close game. 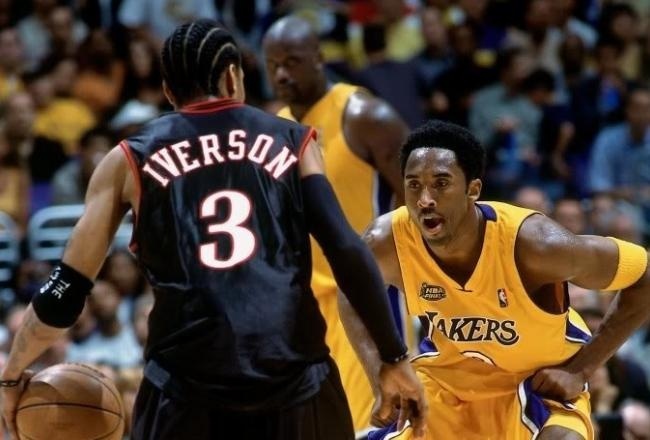 A duel between Kobe and Iverson was taking place and while Iverson led the game in scoring with 35 points, it was Kobe and the Lakers who would walk away with the victory. Iverson however, played his heart with 35 points and 12 rebounds, keeping the 76ers in the game regardless. Kobe would lead the Lakers in scoring with 32, as the Lakers took a 2-1 series lead over the 76ers with a 96-91 victory in Philadelphia. -The 76ers had their backs against the wall. Down 2-1 in the series, Iverson came out as usual playing hard, but the rest of the team just couldn't seem to get it together. The Lakers walked out of game 4 with a 100-86 victory to take a 3-1 series lead off of Shaq's 34 points and 14 rebounds performance. Iverson put on yet another 35 point performance here, but once again, it just wasn't enough. As Game 5 approached, could the 76ers will themselves to a victory and back into the series? Or were the Lakers about to get their 2nd title in a row? -The Lakers would cement their legacy even more on Philadelphia's home court and in Kobe Bryant's hometown. 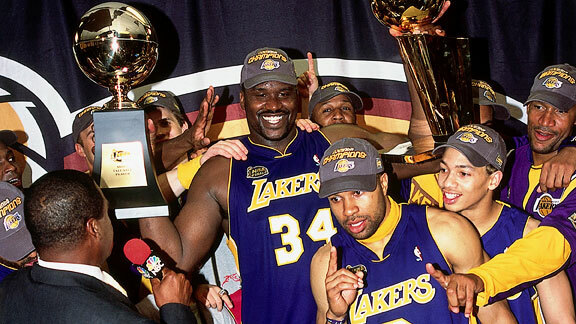 Their 2nd straight NBA championship was won in game 5, as Shaq led them with 29 points and 13 points. 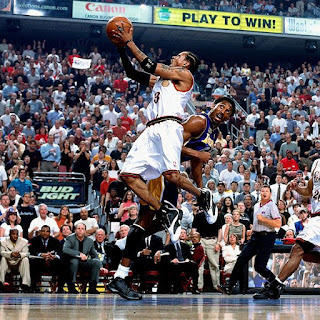 Iverson yet again went crazy scoring, as he was the leading scorer with 37 points, but unfortunately, it was not enough and the Lakers would walk away with the NBA title and a 108-96 victory. 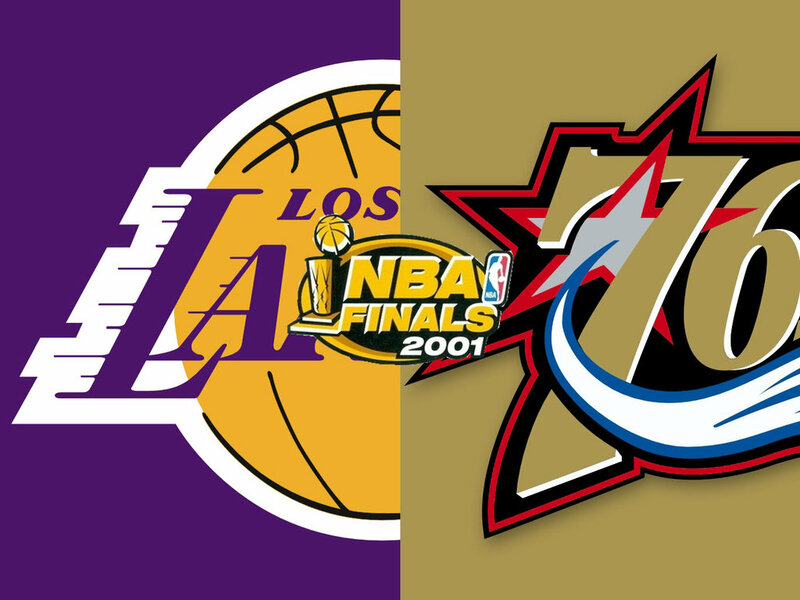 Iverson and the 76ers would never make it back to the NBA Finals again, while the Lakers would complete a 3-Peat the following season. Shaq was named the NBA Finals MVP, as his performance through the Playoffs period was dominant. The Lakers beat the 76ers 4-1 in the series.